Wei WuXian took his time stepping aside, as if he was unwilling to leave. Jin Ling was the first to move over. He looked outside through the thin slit between the wooden boards. It was already nighttime. In the cold atmosphere, even the fog in Yi City had somewhat dissipated, just barely allowing one to see the street at a few meters away. Jin Ling peeked for a while. Failing to find the “amazing”, “pretty” thing, he was rather disappointed, thinking to himself, I didn’t scare it away by talking, did I? Just as he was about to give up, a small, shrivelled figure suddenly flashed before the slit. Jin Ling’s lips twitched in dissatisfaction. As soon as he finished his sentence, he immediately took off one of the boards. Not only the boys inside, even the ghost outside the window jumped from his sudden movement, warily raising her bamboo pole. Hearing this, the girl’s ghost paused, then opened her mouth. Blood gushed out from her empty mouth. Her tongue had been pulled out from its root. The disciples were covered in goosebumps, yet they felt a same sense of sympathy, So that was why she could not speak. Both blind and mute—how unfortunate. Nobody understood. The girl was so anxious that she stomped her feet, using her pole to write and scribble on the ground. Yet, she clearly wasn’t from a scholarly family. She was illiterate and couldn’t write anything. With only a mess of stick-figures, no-one could understand what she was trying to say. Suddenly, from the far end of the street came a series of sprinting footsteps and human pants. The girl’s spirit suddenly disappeared. She’d probably come back again, though, so Wei WuXian wasn’t worried. He quickly put the board back and continued peeping outside from the slit. The rest of the disciples wanted to see the situation outside as well, and all squeezed in front of the door. A row of heads stacked from the top to the bottom, blocking the entire slit. Although the fog had thinned for a while, at the moment, it started to circulate again. A figure clumsily broke through the fog and rushed over. A group of walking corpses followed the person. Moving quickly, they soon caught up to him. The person faced the attacks by unsheathing his sword. Its bright, limpid sword glare sliced the fog open. Wei WuXian silently cheered, What a good move! After a moment of thinking, Wei WuXian left the window and walked inside the central chamber. The boys couldn’t help but follow him with their eyes. Differently-postured paper mannequins stood silently between the two wreaths. Wei WuXian strode in front of them, and stopped in front of a pair of female mannequins. Each of the paper mannequins looked different. Yet, this pair seemed as if they were purposely made to be two twin sisters. Their makeup, clothes, and features were all the exact same. With curved brows and smiling expressions, one could almost hear their “hee-hee” laughter. They wore double-buns, red earrings, gold bracelets, and embroidered shoes, closely resembling a pair of maids from a wealthy family. He lightly brushed his hand against a boy’s unsheathed sword, producing a cut on his thumb. Turning around, he smeared two pairs of eyes, four pupils, onto the mannequins. Out of the blue, a chilly breeze drifted across the entire shop. The boys couldn’t help but tightly grip their swords. All of a sudden, the twin mannequin sisters suddenly trembled. The next moment, giggles of “hee-hee” really came out of their brightly tinted lips! It was the Summoning of Painted Eyes! As if they saw or heard something hilarious, the pair of paper mannequins giggled incessantly. At the same time, the eyes painted with human blood spun rapidly inside their sockets. The sight was truly stunning, but also truly frightening. Standing before them, Wei WuXian lowered his head in salutation. With respect, the pair of paper mannequins also bowed slightly, returning salutations of a higher level. Shrill laughter emerged from the mouths of the paper mannequins. An eerie gust of wind threw the doors open! Side by side, the two mannequins swept outside and into the circle of walking corpses. It was beyond belief how, although they were mannequins made from pieces of paper, they had such strong powers. With dainty shoes and drifting sleeves, they severed the arm of a corpse with one swish of their hands, then severed half of a head with another—it was as if the paper sleeves had been turned into keen blades. The flirtatious giggles continued to echo through the entire length of the street, bringing about both horror and allure. Not long afterward, the fifteen or sixteen walking corpses had been chopped into broken chunks that lay limply on the ground! The two paper maids gained a complete victory. Obeying the command, they carried the weakened escapee inside. Then, as they jumped outside again, the doors closed on their own. Each of them guarded each side of the entrance as if they were lion statues that guarded estates, and finally quieted down. The disciples inside the room were shocked speechless. They had only seen and heard the descriptions of improper cultivation methods from books and their own seniors. At the time, they couldn’t understand it, If they were improper methods, then why would so many people still want to learn them? Why would the YiLing Patriarch still have so many imitators? And, now, after they had seen it with their own eyes, they finally realized the fascination around these sorts of practices. Moreover, this was only the tip of the iceberg—the “Summoning of Painted Eyes”. Thus, after the boys got over the initial shock, there were no signs of repulsion on their faces, but instead excitement that couldn’t be concealed. They felt that it enriched their experiences, allowing for more conversations between their juniors and them. Jin Ling was the only one who didn’t look too well. The voice sounded extremely tired. He asked the question not only because he didn’t know who the people in the room were, but also because he couldn’t see anything. A thick layer of white bandages wrapped around the man’s eyes. He was probably blind. And, not to mention, he was both blind and relatively good-looking. With a high nose bridge and thin lips that had the hue of a soft red, he could almost be described as handsome. He looked quite young as well, somewhere between a boy and a man, naturally gaining the sympathy of anyone who came across him. Wei WuXian wondered to himself, Why have I been meeting so many blind people in the past few days? Both heard and seen; both alive and dead. Lan JingYi fumed, “You…” Before he could finish his sentence, it was as if the cat got his tongue. It was because he saw the sword that the man propped up against the table. The black cloth wrapped around it had somewhat fallen off, and the body of the sword could be seen. The sword was forged with unequaled skill. The sheath was in the color of bronze, with intricate patterns of frost hollowed out. Through the patterns, the body of the sword shone through as if it was made of silver stars, glistening with snowflake-shaped flecks of luminescence. There was a pure yet bright sense of beauty to it. 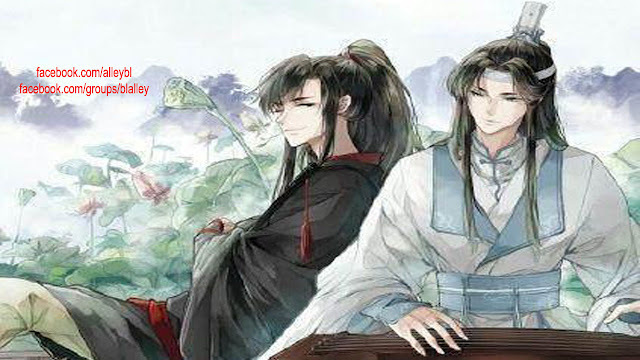 Lan JingYi widened his eyes, as if he was about to blurt something out. Even though Wei WuXian didn’t know what he wanted to say, since the man covered his sword with black cloth, he clearly didn’t want it to be seen. Instinctively not wanting to alert the stranger, he covered Lan JingYi’s mouth with one hand and put the index finger of his other hand to his lips, signalling for the similarly astonished boys to make no sounds. Wei WuXian mouthed his question, Xiao XingChen’s sword—Shuanghua? Jin Ling and the rest nodded in confirmation. One of the boys thought of this as well. He couldn’t help but reach out toward the bandages wrapped around person’s eyes, in hope of taking them off so that he could see if his eyes were still there or not. Yet, just as his hand touched the bandages, a pained expression appeared on the person’s face. He inched backward slightly, as though he was scared of his eyes being touched. Noticing his own rudeness, the boy immediately took his hand away, “Sorry, sorry… It wasn’t on purpose. His voice, though, trembled faintly. With such behavior, one could almost ascertain that this person was Xiao XingChen, who had disappeared after the case of the YueyangChang Clan. Wei WuXian, “Me? Sorry, but were you talking about me?” He really couldn’t speak the truth—Xiao XingChen had already breathed in too much of the corpse-poisoning powder. With a dark red hue to his complexion, he was most likely too ill for rice congee to work. Just as he finished his sentence, the sinister giggles of the mannequin sisters came from outside the door. This time, the laughter was sharper than ever. Qiao: This has been mentioned in the past. See the vocabulary sheet if you find yourself having memory loss. Summoning of Painted Eyes: This originated from the story of a man who added pupils to the painting of a dragon, and the dragon became real. The incantation here is partly from He SiCheng’s poem—Meeting a Beauty in Nanyuan. Since he’s not a well-known poet and it’s not a well-known poem, it hasn’t been translated to English yet. Thus, although I spent quite a long time on it, the translation here is definitely not professional or even anywhere near perfect. Major thanks to Tracy for helping me.